UP AND CLOSE: THEIR ART. THEIR STORIES. 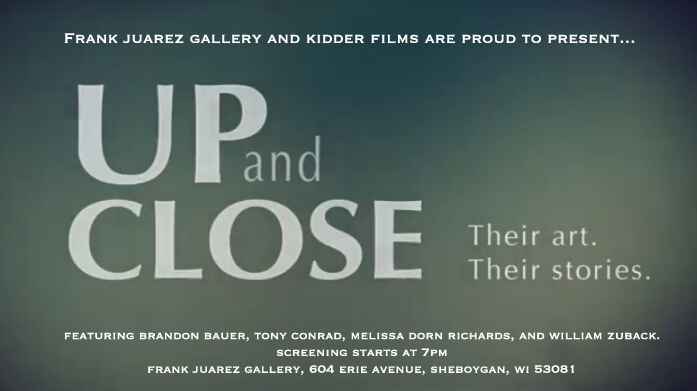 The Frank Juarez Gallery and Kidder Films are excited to announce a special documentary, Up and Close: Their Art. Their Stories. Over the past few months, Frank Juarez and Zach Kidder along with Erica Barringer, Summer Intern, and Jenna Kidder visited Brandon Bauer, Tony Conrad, Melissa Dorn Richards and William Zuback and filmed/photographed/interviewed the artists. You will get an up and close tour of their studios, hear them talk about their work, and their influences. On November 16th, The Frank Juarez Gallery will be hosting the premiere Up and Close featuring Brandon, Tony, Melissa and William at the new Knaak + Juarez Studios located on the 2nd floor, 1310 Wisconsin Avenue, Sheboygan 53081. Previous A Call To Halt – Opening Soon!